Let’s talk about test strips, shall we? Test strip accuracy is important to me because______. Short answer: Because we are too technologically advanced these days to make any other excuse. First, a trip down memory lane. I was diagnosed in October of 1982, shortly after my first birthday. (I got called an overachiever yesterday… gotta start early!) The technology that was handed to my scared parents was the equivalent of a typewriter in a room full of Macbook Airs. Heavy, clunky, and involved a lot of guessing. The first round of test strips didn’t belong to a meter at all. These are Chemstrips (thank you Google Image Search.) 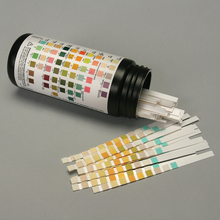 They measured ketone amounts in urine. 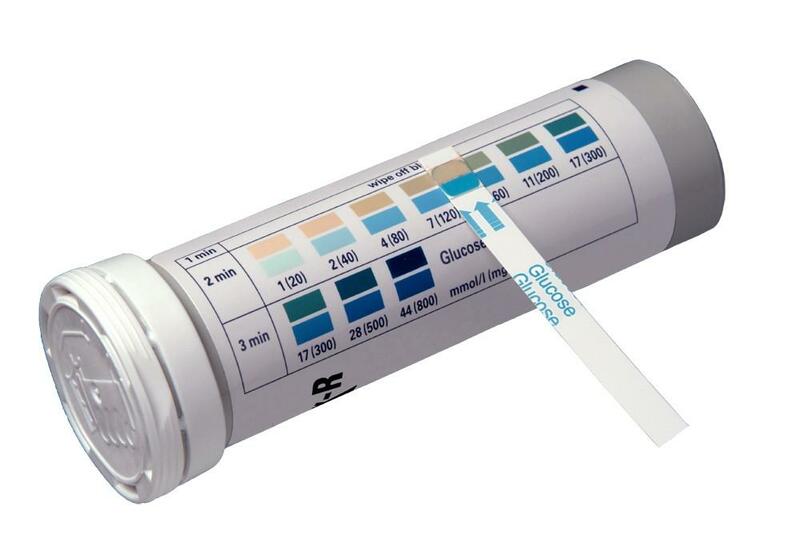 Ketones in urine are usually a tell-tale sign of a high blood sugar. 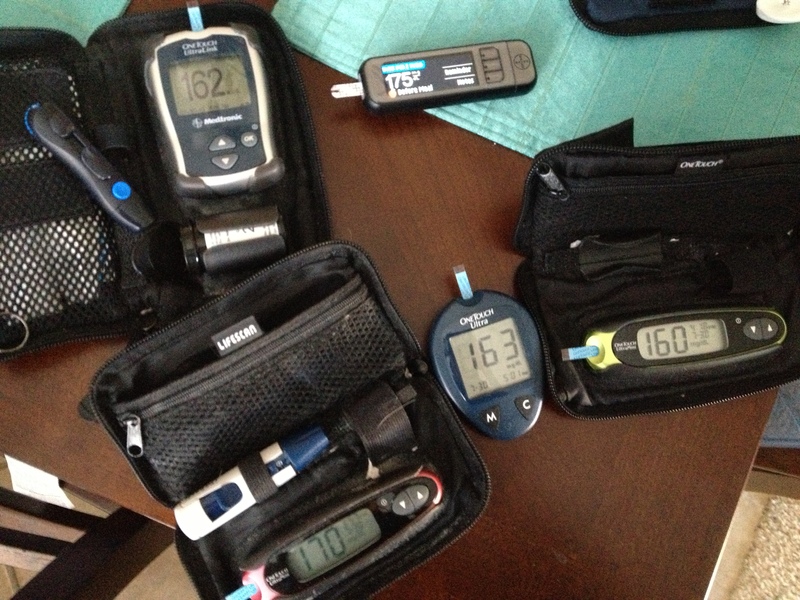 If I had ketones, surely it must mean that my blood sugars were way too high and we must give me more insulin. Have I mentioned that I spent a lot of my early childhood in the hospital? Along with these colorful test strips where the early blood glucose strips of the 80s. These test strips required enough blood to satisfy a vampire’s sweet tooth and only really gave you a range of what your blood sugar could be. They also required time – 2 minutes of waiting for a semi normal blood sugar reading and 3 minutes if you thought your BGs were high. You might as well try to download a 5 MB song on dial-up. It wasn’t exactly accurate either. As I mentioned, it gave you a range based on whatever color the blood left behind on those enzymes. Sandy beige and teal? You were 120 mg/dl. Pea Soup Green and Dark Teal? Hmmm… you are probably in the 200s. Black and blue? You are probably dead. Just sayin’. Later in the 80s, I had this dinosaur. Along with the bad hair and fashion of the 80s, the Reflolux went out of style, making way for new, smaller, less cumbersome meters. These meters had smaller test strips that didn’t require a tourniquet every time you wanted to test. Some even came in fancy colors and could easily fit into a purse. But, again, with this newer technology comes less than perfect results. We’d like to think that the numbers our meters are spitting out are accurate, but our A1Cs didn’t always agree, leaving us frustrated. Now that we’re in the 2000s, we have a wide array of technology available to us. Insulin pumps that make administration easier and more precise than long acting insulins; CGM technology to alert us of spikes and valleys in our sugars and provide us with trends and patterns; meters that take 5 seconds or less to provide results; and really fast acting insulin. All items that should, in theory make our lives easier and our control more streamlined. We live in a society of instant gratification. If we want a song, we download it. If we want to map a roadtrip, we look on our GoogleMap app and it guides us. Want food? A drive through is around the corner. We like things fast, quick, cheap, easy and painless with the least amount of effort. We thrive on short cuts and if it’s “good enough,” it’s acceptable. Guys, this isn’t something that you should “get what you pay for.” The fact that my meter could be pushing out results that are 20%-40% off from whatever number pops up on screen is a bit unnerving. I pay (well, my insurance pays) good money for those boxes of name brand test strips. I ran an experiment this morning. Two different, name brand meters. Two very different post-meal results. 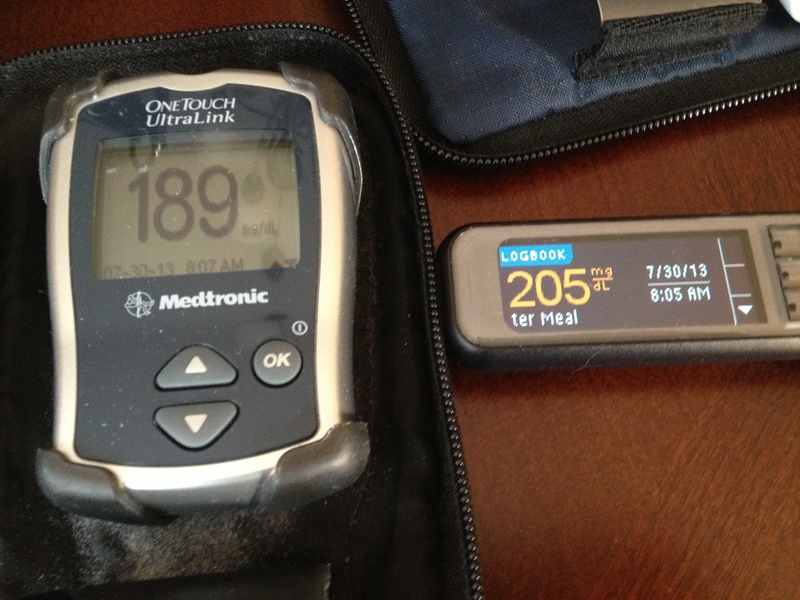 I’d be inclined to issue a correction bolus for the 205, but what if I were closer to the 189? With the extra insulin in my system, I’d flatline by 10 am. Can you imagine what generic test strips and meter results would be popping out? Sure, they are within 20% of each other, but when it comes to insulin dosing, that margin of error can mean the difference between grabbing my GlucoLift or spilling keytones. We have so many pieces of technology available to us and so many advances in our care than I had when I first started out. 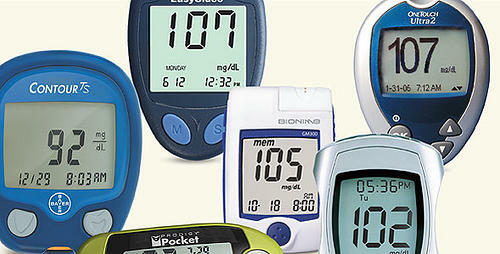 Why does the FDA still think a colorful range of blood glucose results is acceptable? Let’s leave that nonsense in the 80s where it belongs. I was curious and ran a test when I got home using every meter I owned. Not horrible, however, surprised that the two meters that are essentially the same model came up with wildly different results in comparison. I also issued a correction bolus for the 175 mg/dl. Let’s see if I crash, stabilize, or rise after dinner. You don’t need to convince me about the perils of inaccuracy! But the more we get the word out, the more likely we are to see change — so good job with this post! Just yesterday, I saw a tweet from one of the manufacturers bragging about their accuracy and using the #stripsafely hashtag. So they’re getting the message. Lets hope they’re acting – with honesty and integrity – on it. As for that meter, I remember it branded not as Reflolux, but Accu-Chek II. 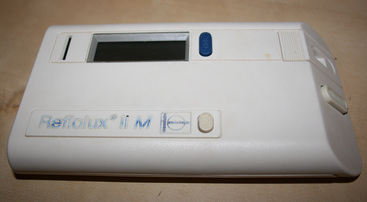 (The original Accu-Chek was about three times the size and six times as cumbersome — I’ve seen images of it online, but also with the Reflolux name.) I wonder what the name-game is all about? Did one company acquire the other? Was it a different-country different-name type of game? Out of all the posts I have read so far on the strip safely blog carnival, I have to say I think yours is my fav so far. I was diagnosed 5 years ago so I know nothing about the 80’s technology and this was amazing to see how things were only 30 years ago. Wow! It has come a long way,but at the same time…. Really? Great post. Is it wrong though that I was even more interested in the tech itself than in the repercussions of the tech?